Storyline: This books Follows a boy and his pal as they read a children storybook. But wait, there is more to reading a story then just opening the first page and let your imagination take hold of the words on the paper…As a matter of fact, there is an instruction book for children, a do-it-yourself book, a self-help guide in ten steps. And it all starts, of course, with step one: finding a story. And it cannot be any kind of story, it has to be a good one. Then you go to step two, which is finding a reading buddy, then step three, four and so on. As you go through these steps, making sure to follow instructions, you have a lot of tasks to accomplish: finding a cozy spot to read, trying to decipher the book cover, imitating the characters, making up the unknown words, making sure the reading buddy doesn’t get bored and gets a chance to see pictures, taking a break if necessary. By the last step, the reader should be pretty tired but also thrilled about the story and a bit wiser then at the beginning. But wait…there is more. When all is done and said, you are expected to start the book all over again! 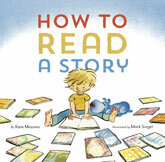 This is a fun book to read if you have a little “reading buddy”. Illustration: Mark Siegel is the illustrator of this book. Through the pages of this book, Siegel tries and mostly succeeds to keep up with the story points. He gets into the child’s imagination and shows us what is that the little kid is thinking about as he gets ready to read the book, and as he reads it. The cheerful pastel colors that the illustrator uses stand out on the white background of the pages.